Preheat oven to 180°C/355°F. Separate eggs, adding egg whites and egg yolks to separate bowls. Add vanilla sugar and salt to egg whites and beat until stiff. Add sugar to egg yolks and beat for approx. 2 min. or until foamy. Add flour and unsweetened cocoa powder to the egg yolk mixture and stir to combine. Carefully fold in beaten egg whites. Using an offset spatula, spread the batter in a thin layer onto a silicone baking mat-lined baking sheet and bake for approx. 5 min. Remove from the oven and let cool completely. Set one-fifth of the heavy cream aside, and add remaining heavy cream to a bowl. Add cream of tartar and beat until stiff, then refrigerate. Soak gelatin in cold water. Add the unbeaten heavy cream to a saucepan over medium heat. Stir in soaked gelatin until it’s dissolved, then remove from the heat. In a separate bowl, add mascarpone cheese, confectioner’s sugar, and vanilla extract and beat until combined. Add cream-gelatin mixture and stir to combine. Carefully fold in the chilled whipped cream. Remove the sponge cake base from the silicone baking mat and cut out two pieces according to the length your loaf pan. Add plastic wrap to the loaf pan and transfer one sponge cake base to the pan. Spread half of the mascarpone cream on top and refrigerate. Chop some of the dark chocolate and add to a bowl. Heat up remaining heavy cream in a saucepan over medium-low heat. Add warm heavy cream to chocolate and stir until combined and completely melted. Let cool for approx. 10 min., then add the chocolate glaze on the first mascarpone cream layer in the loaf pan. Refrigerate for approx. 30 min. Spread remaining mascarpone cream on the cooled chocolate layer and place the second cake base on top. Refrigerate for approx. 60 min. Remove the loaf pan from the fridge and take out the icebox cake and remove the plastic wrap. 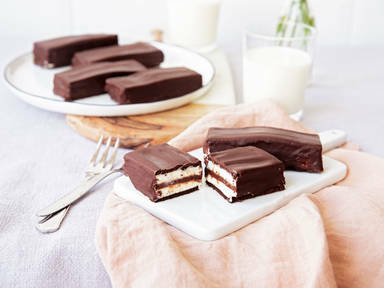 Cut into equal-sized chocolate bars, approx. 9x3 cm/3.5x1 in., then transfer to a wire rack. Chop remaining dark chocolate and melt in a heatproof bowl over a pot with simmering water. Add coconut oil and stir to combine. Remove from heat and let cool down for approx. 10 min. Spread 2 tbsp the chocolate frosting on each bar to glaze the top and sides. Refrigerate for at least approx. 2 hrs. or overnight. Store in the fridge in an airtight container and enjoy cooled!